At OMNI FLOWERS, after lot of hard work and trials we tried to creat a floral tribute of Khanda for the first time in Canada. We prepared it in two sizes small and large. This one of its own kind of Khanda can be ordered from OMNI FLOWERS by calling 905 451 2828. Emblem of Sikhism- Deg Teg Fateh. The Khanda is one of the most important symbols of Sikh Religion. The khanda is like a “coat of arms’ for Sikhs. It was introduced by Shri Guru Guru Hargobind Ji. It is an a combination of three symbols, represented by three different items. It is commonly found on the flag of the Sikhs, anywhere in the Sikh Temples. The Sikh Emblem was created by the Shromani Gurdwara Parbandhak Committee (SGPC) after its constitution in the early twentieth century, when it depicted the Sikh doctrine “Deg Teg Fateh” in the form of Emblem (logo). Since then it is seen inscribed on the Sikh national flag/ letter heads and the stamps of various Sikh organizations. The doctrine is first found in written form in Persian, on the seal of Banda Singh Bahadur (1708–1716), stamped on his letters. The seal bore the inscription: “Deg-O-Teg 0 Fateh-Nusrat-I -Bedrang Yafat -Az Nanak—Guru Gobind Singh” i.e., The kettle (Deg)- (The Sikh symbol of economy, the means to feed all and sundry on an egalitarian base), sword (Teg)-(The Sikh symbol of power, to protect the weak and hapless and smite the oppressor), victory and unending patronage are obtained from Gurus Nanak—Gobind Singh “. After Banda Singh, this inscription was adopted by the Sikh Misals and then by Sikh rulers for their coins also. Now the official seal of Akal Takhat bears this inscription. The circle in the emblem of Sikhism represents the Deg (cauldron or kettle) used to prepare food, Guru ka Langar initiated by the founder of the Sikh faith, Guru Nanak to remove caste barriers, teach people equality and humility before each other and to feed all and sundry on an egalitarian base so that no body sleeps with an empty stomach. The two swords on the outside represent the Miri—Piri (Bhagti and Shakti) doctrine of Sikhism, revealed by Guru Nanak and put into practice by his sixth successor, Guru Hargobind indicating the integration of spiritual and temporal powers together and not treating them as two separate and distinct entities. In the center is the Khanda, the double-edged sword, used by the tenth Guru, Guru Gobind Singh to prepare Amrit to initiate the Sikhs. Khanda has cutting edge on both sides indicative of two swords fused together representing Bhagti and Shakti (spiritual and temporal powers), giving birth to “The Khalsa”, who is a saint-soldier (Sant-Sipahi), the saint meaning scholarly in knowledge of Gurbani and soldier meaning martial in spirit. To summarize, the Sikh national Emblem, reminds the Sikhs that they are warriors, they should take Pahul (Amrit), become ‘Khalsa’ i.e., The ultimate form of the Sikh, keep Guru Ka Langar going so that no body sleeps hungry, protect the weak and hapless, fight injustice and oppression, wherever it takes place, the victory will be theirs: ‘Deg-Teg-Fateh’. There are three different items used in a Khanda, which also have a symbolic meaning. Two single-edged swords, are crossed at the bottom and sit on either side of the Khanda and Chakaram. In the symbol the sword to the left represents truth, and the sword to the right represents the willingness to fight for what is right- dharma (religion). The circle in the middle denotes the one God, never beginning and never ending. 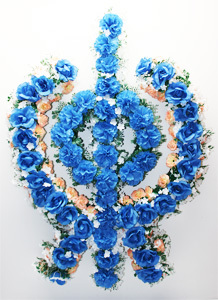 Omni Flowers brampton 905 451 2828 / www.omniflowers.com ….took this initative for the first time in Canada to produce a true replica of Khanda Sahib in way of floral tribute. Every Khalsa should display the same infront of their house or in Baba ji room with pride. Please call us for details and pricing. This is a silk flower / artifical flower presentation. Please support this one of its own kind project. This entry was posted in General and tagged artifical khanda floral, buy khanda, floral khanda, flower khanda khanda flowers, Khanda, khanda brampton, khanda canada, khanda floral tribute, khanda pride., khanda tribute, khanda with flowers, large khanda, omni khanda, sikh khanda, small khanda. Bookmark the permalink.